*** THE TEAM *** During the seven years she worked for Company Marie Chouinard, dance artist Lucy M. May spent innumberable hours walking, waiting and observing social structures, city plans, and life- and landforms while on tour in foreign places. She and her co-workers Paige Culley and Noémie Avidar found complicity in their shared thirst for time outside the dark of theatres and the cubes of studios. In 2014, Lucy and composer Patrick Conan were invited to create a short work for an alley way in Hochelaga, during Bête Sauvage's Les Salons de l’est -- a walking tour of performances throughout the neighborhood. For the first time, the four artists convened to make Vivarium, a work that would invite the public to look closely and to slow down, through performed actions of touch, vibration, and tending. They chose to use the immediacy of the environment and the event -- and the porousness and unpredictability of the circumstances -- to frame the creation. Unexpected events during this initial performance prompted the group to continue their research and conversations in the ensuing years. They continue to question the implications of their presence in public and private spaces, and draw notions of colonization and co-habitation into the heart of their creative choices. 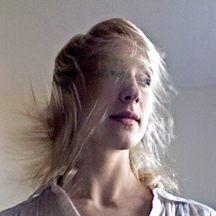 *** BIOGRAPHIES *** <<<< LUCY M. MAY >>>> is a contemporary dance artist, teacher, and writer for The Dance Current based in Montréal. In recent years, Lucy has developed choreographic work for screen, paper, site-specific locations, and the stage. Currently, Lucy is developing performances that ask how geo- and bio-social environments thread their way through human movement (Vivarium; Esemplastic Landing; reaching over a brink of darkness, folding open to a starlight trepanation). She imagines her moving body as a meeting place, where theories and conversations find confluence with what is local, sensual, or tactile. Lucy was a member of Compagnie Marie Chouinard for seven years, and dances independently with Margie Gillis, Alejandro De Leon, Sasha Kleinplatz, and choreographers based in her natal province of New Brunswick. She dances to wonder after what binds micro to macro, macro to micro. Lucy is a graduate of LADMMI and the Rotterdam Dance Academy in the Netherlands. <<<< PATRICK CONAN >>>> a graduate of Vanier College with a DEC in Percussion, is a drummer and percussionist who has been playing music professionally for the last 20 years. He has played in numerous projects and toured Canada, the United States, and Europe. Notable acts include Tricky Woo, Sackville, and The Carnations. Current projects include Sam Shalabi's Land of Kush and Traces. Patrick also composes his own music, working with MaxMSP, field recordings, and found sounds. He composed music for Vivarium, an ongoing collaborative project with Lucy M. May which was performed at Les Salons de L’est in 2014 and Suoni Per Il Popolo in 2017. He has composed for contemporary dance works since 2013, presented at Short&Sweet and for Nathan Yaffe’s Dunno Wat U Kno.which was presented at Tangente in 2017. <<<< PAIGE CULLEY >>>> originally from Rossland, British Columbia, entered the professional training program at the School of Toronto Dance Theatre, where she was awarded the Hnatyshyn Developing Artist Grant for contemporary dance. Upon graduation in 2010, Culley worked as part of Dancemakers, performing work by Antonija Livingstone, Martin Belanger and Ame Henderson. From 2011-2016 Culley performed extensively with Compagnie Marie Chouinard, both interpreting existing repertoire as well as developing original roles. Recipient of the 2012 danceWEB scholarship at ImPulsTanz in Vienna, Culley was mentored deeply by Robin Poitras and Benoît Lachambre. Part of the inception and premiere of "More than Naked" by Doris Uhlich and the Montreal version of "Nature Redux" by Marten Spangberg, Culley continues to embody diverse performative roles, also working with Daina Ashbee, Le Carré des Lombes and Lucy M. May, and proceeding with gratitude for the many forces who have nourished and continue to circulate the traditions from which she receives so much. <<<< NOÉMIE AVIDAR >>>> originally from Brussels and Tel Aviv, has been creating scenography in Montreal since her graduation from the National Theatre School of Canada in 2009. She has travelled between theatre productions (Théâtre L’Instant, Groupe La Veillée), circus (École Nationale de Cirque), and installations for events (Festival International du Film sur L’Art), to arrive finally in dance (Compagnie Marie Chouinard et la Fondation de Danse Margie Gillis). She is an assistant and consultant for independent projects and collaborations. Noémie continually revisits and questions ways of making scenography in the contemporary world. She has used etching, photo-collage, text, the Internet, plants, and public participation to activate her scenography, every time ephemeral. Help us remount the performance Vivarium for indoor spaces in Montréal and beyond!